Disney’s “Dumbo” is off to a lukewarm start at the box office with a $45 million opening weekend from 4,259 screens. While some independent trackers projected a lower opening, Tim Burton’s remake is launching below the $50 million-plus start that Disney had hoped for. 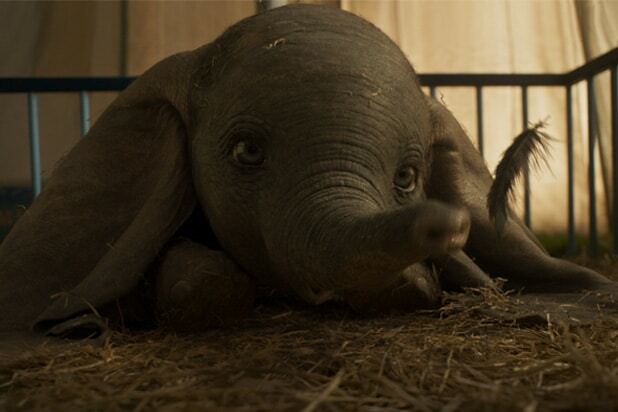 “Dumbo” opened day-and-date worldwide, adding $71 million from overseas markets for a $116 million global launch against a reported $170 million budget before marketing. Families comprised 54 percent of this weekend’s audience, who gave the film an A- on CinemaScore. But other barometers of reception aren’t as strong, with a 3.5 score from general audiences on Postrak and a 50 percent score from critics on Rotten Tomatoes. This likely means trouble for “Dumbo” next weekend, when “Shazam,” a superhero film built as a four-quadrant crowd pleaser, could pull away both family and general moviegoers. In second this weekend is Universal’s “Us,” which held decently with $33.6 million for a drop off of 53 percent from its $71 million opening. While that is not as strong a hold for Jordan Peele as “Get Out,” which dropped 15 percent from a $33 million opening in 2017, it’s still better than the 60+ percent drop that is customary for horror films. The movie now has a 10-day domestic total of $128.2 million. Taking third is “Captain Marvel” with $20.5 million domestic and $46.9 million worldwide in its fourth weekend. That will push its domestic total past the $350 million mark, while taking its global cume to $990 million. Completing the top five are CBS Films/Lionsgate’s “Five Feet Apart” and Pure Flix newcomer “Unplanned,” both estimated to land in the $6 million range this weekend. “Five Feet Apart” will take fourth with $6.25 million in its third weekend for a domestic total of $35.8 million. “Unplanned,” meanwhile, has earned the second best opening of any Pure Flix release behind only the $7.2 million opening of “God’s Not Dead 2.” The anti-abortion true story film opened to $6.1 million from 1,059 screens. The film has mixed reviews from critics with a 50 percent RottenTomatoes score but has won over Christian audiences. Farther down the charts, Universal’s “How to Train Your Dragon: The Hidden World” crossed $150 million domestic and $500 million worldwide in its sixth weekend in theaters, adding $4.2 million from North America to take the No. 7 spot and bring its domestic total to $153 million.